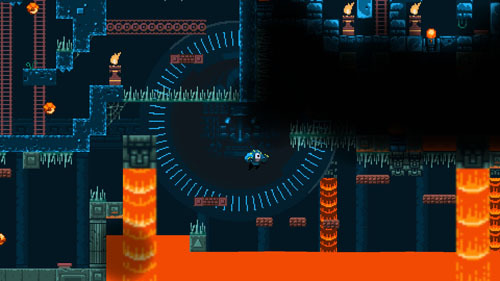 1 Screen Platformer offers tightly-wrapped level design to make the most of its single screen confines, but there’s only one overlap point in the environment, which comes from a revolving ring of platforms at the center of the temple. There is no gameplay advantage to zooming out the camera and no obstacles that require the use of the zoom feature. 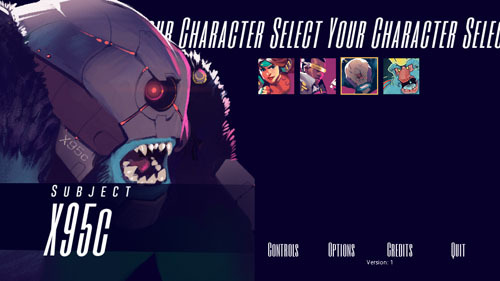 What makes this game unique, however, are its four playable characters, each with different level objectives, and some with new abilities. The first playable character is Nadia Stormhammer, commander of the Geodesic Celestial Liberation Front antiquities wing, according to her profile, and her abilities and goals are the most simple. She has a 2x variable jump, which she uses to hop on platforms and dodge obstacles, with a goal of simply reaching the end of the level as quickly as possible without being killed. Along the way are torches that are lit by touching them, and getting killed returns the player to the most recently lit torch. Next is Vez Rendoux, an anagram of “rendezvoux”, who has the ability to double jump, which makes environmental navigation a bit easier. 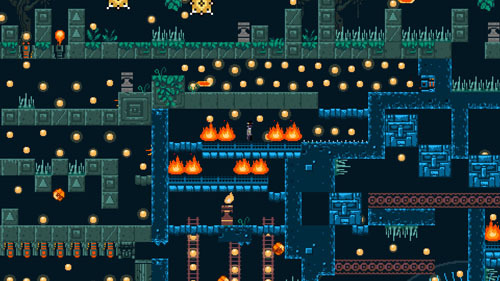 When playing as this character, the level is filled with glowing orbs, and the only way to activate a checkpoint torch is to collect all of the glowing orbs leading up to it. Subject X95c is a monstrous creature, and the subject of some sort of biological experiment. This creature also has a double jump, but she is unable to see anything but her immediate surroundings… apparently as a result of being designed to check for weaknesses in the temple’s defenses. The entire environment is filled in blackness that only disappears once X95c walks into the area, including falling into level hazards. As such, it’s best to play with the other characters first in order to become familiar with the layout of the environment. The only way to complete the level with X95c is to clear 100% of the fog. 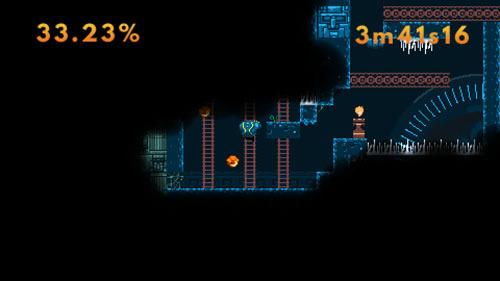 If any fog remains when the player reaches the end of the level, it is highlighted in pink, and the player may backtrack, or pause the game and warp to any activated torch along the way. Finally, there is The Royal Zombie King, who also has the ability to double jump, along with something called “gold lust”. 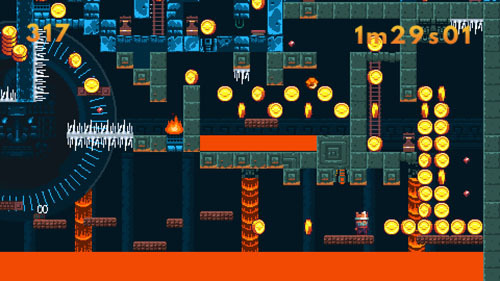 Here, the player must run through the level collecting gold coins, and all of them must be picked up in order to complete the level. Getting killed causes you to drop 10 pieces of gold, but sometimes you can recover it, and there are often rubies (worth 10 gold) placed in hard-to-reach places to provide a bit of extra challenge. Unfortunately, the only way to unlock this character is to sign up for the developer’s mailing list. 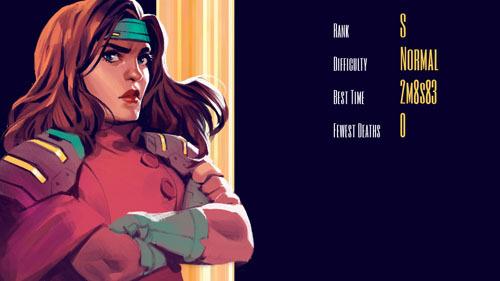 Each of these four characters allows the player to tackle the environment in different ways, and each character is ranked on completion time and number of deaths at the end of the run, with a letter rank based on performance. 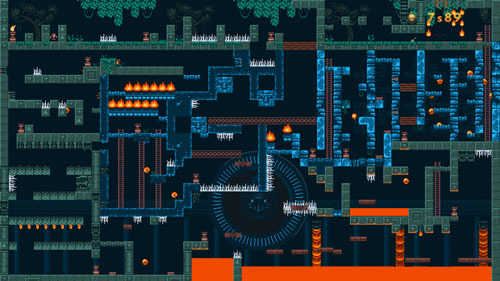 Level hazards include spike pits and pools of lava, along with blocks that can crush you, crumbling platforms, flame spouts, moving fireballs, and fast-moving laser pulses. 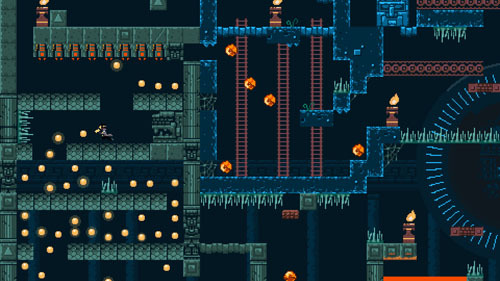 The player is able to jump and climb ladders (and jump up ladders for extra speed), as well as ride on moving conveyor belts and moving platforms, while also making use of springboards that launch him into the air. The entire game can be completed on a first attempt with all four characters in under an hour, with replay value added in competing for a higher ranking. 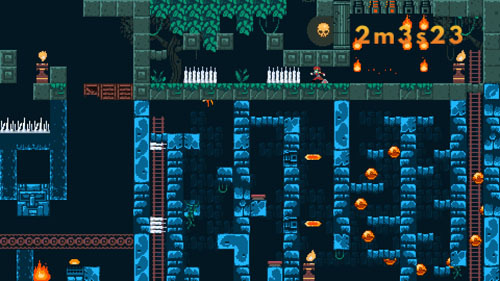 The game also offers a harder difficulty mode which places the player in the same environment but with a drastic increase in the number of level hazards, as well as more complex flame spout patterns and faster moving fireballs to truly put the player’s platforming skills to the test. 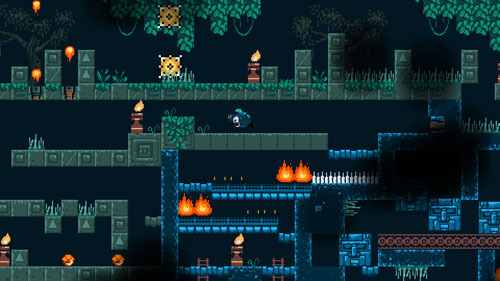 1 Screen Platformer was created by an Arizona-based studio called Return to Adventure Mountain, headed by Chris Zukowski. Environment art for the game was created by Luis Zuno of Ansimuz Games, the studio behind Elliot Quest, with player character art by Michael Hussinger (Nova-111), character design and marketing art by Eric Hibbeler (Crashlands), and engine code by Rupeck Games (Caveblazers). The studio previously developed City Tuesday.